December 11, 2017, Munich, Germany – Devexperts, the developers of retail and institutional trading platforms and the providers of cloud based financial data infrastructures, today announced technology updates of turn-key solutions for brokerages, investment firms and trading venues to meet the MiFID II Directive, which will apply throughout Europe from January 3, 2018. 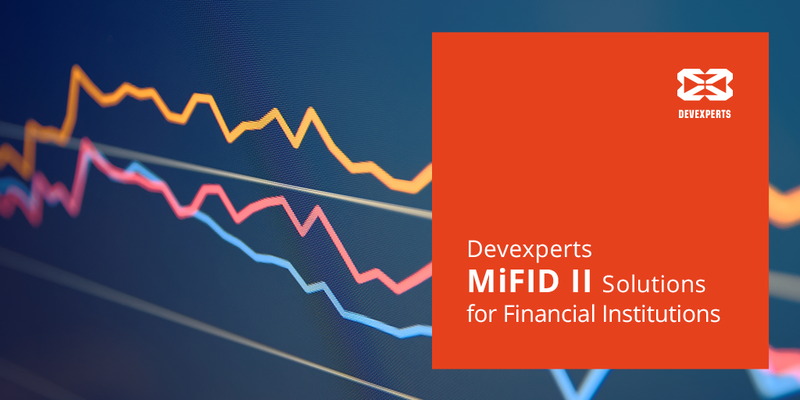 Devexperts solutions address financial market players, looking for a scalable system, who store and work with large volumes of data and are willing to perform optimal MiFID II transition. These solutions provide access to aggregated normalized market data and referential content to support analysis and reporting. This is achieved by utilizing the power of cloud computing and virtually unlimited capacity and scalability of data storage (for options, equities, futures and indices data). Besides developments in the particular fields affected by regulatory matters, Devexperts provides consulting services and custom solutions for financial institutions in the fields of real-time transaction processing, trading automation, risk management and highly complex, enterprise wide big-data applications. Devexperts solutions are designed with the objective to be easily integrated into the market participants existing environment. Oleg Solodukhin, CEO of Devexperts Data Division said: “We, as a financial services vendor, are offering our clients the proven solutions to continue their operations painlessly after MiFID II goes into effect on the 3rd of January. Following a lengthy preparation process to help our clients meet the specific requirements, we can assure that after the last updates our technology has the capacity to make the transition easier for brokerage companies, investment firms and trading venues, so they can close the gaps in storing, transparency and reporting, without excessive data collection overload of their assets”.